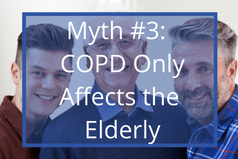 In a survey conducted between 2009 and 2011, 4% of Canadians between the ages of 35-79 reported being diagnosed with Chronic Obstructive Pulmonary Disease (COPD). However, lung function tests showed that as many as 13% had results indicative of COPD. The Canadian Health Measures Survey (CHMS) report concludes that COPD is an under-diagnosed disease in Canada. Although there’s no cure for COPD, patients can maintain quality of life with the right lifestyle changes and treatments. 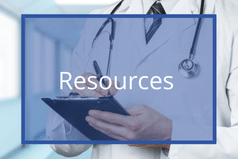 This guide is intended to help you and your loved ones learn more about the impact of COPD and potential lifestyle changes and treatments involved in accommodating the disease. Be sure to speak with your healthcare provider if you think that you, or a loved one, is at risk for COPD. 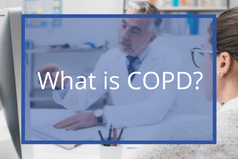 COPD is a lung condition associated with blockage of the airways due to mucus accumulation and swelling, and/or damage to tiny air sacks in the lungs. This makes it very hard to breathe, affecting one’s overall quality of life. COPD refers to two progressive and long-term diseases: chronic bronchitis and emphysema, which often are diagnosed together. Bronchitis occurs when your bronchial tubes become infected and swollen. Acute bronchitis can happen to anyone after suffering from a cold or the flu. However, persistent and repeated symptoms may result in a diagnosis of chronic bronchitis. Emphysema is a form of chronic lung disease that occurs when the lining of small air sacs in your lungs, known as alveoli, become damaged. The alveoli fill up with air as you breathe in, and deflate as you breathe out. Oxygen in the alveoli moves through to your blood capillaries, which link up to larger blood vessels that carry oxygen throughout your body. Once the fragile alveolar tissue is destroyed in your lungs, air pockets form and air get trapped in your lungs. Your lungs then grow larger and it becomes much harder to breathe. 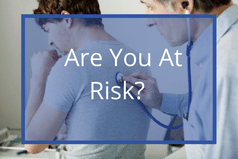 Are You at Risk of Developing COPD? 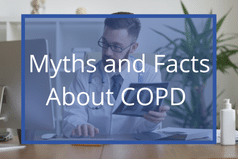 There are many people at risk of developing COPD who aren’t even aware of the disease. In 2012, it was the fourth-leading cause of death in Canada and it is expected to become the third-leading cause of death worldwide by 2020. Smoking is the leading cause of COPD. In Canada, between 80% and 90% of those diagnosed with this disease currently, smoke or have previously smoked in their lifetime. This means that COPD is, for many people, preventable. Other causes may include long-term exposure to lung irritants. Long-term exposure to certain chemicals, fumes, or dust can contribute to COPD. Heavy long-term exposure to air pollutants and second-hand smoke also increase one’s chances of developing COPD. In some cases, COPD can be caused by a genetic condition known as AAT (alpha-1 antitrypsin) deficiency. Those with this deficiency have a predisposition toward developing COPD without having been a smoker and in the absence of long-term exposure to lung irritants. 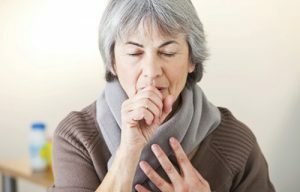 What Are The Signs & Symptoms of COPD? Understanding the signs and symptoms of COPD is the first step in knowing when you should book an appointment with your doctor. If you’ve already been diagnosed with this disease, it is important to identify the signs of an exacerbation or flare-up. If you notice any of the symptoms listed below, speak to your healthcare professional right away. Understanding the early symptoms of COPD can help you to catch the disease early and manage the condition more effectively. Symptoms are generally mild at the beginning and can be confused with having a cold. Chronic cough is often the first symptom of COPD. If you notice that your cough lasts 3 months or longer within a year, for at least 2 years, you should talk to your family physician as soon as possible. Shortness of breath, even after mild activities. A persistent cough that doesn’t go away. Frequent respiratory illnesses, such as the cold, flu or pneumonia. If you notice these symptoms, speak to a healthcare professional right away for diagnosis and treatment. As this disease progresses, quality of life can degrade to a stage where you may not be able to take care of yourself at home. Swelling of ankles and/or feet. When COPD has progressed to this stage, you are at a much higher risk of developing cardiovascular diseases, such as heart attack and stroke. If you or a loved one are experiencing an exacerbation you may need to seek immediate medical attention. 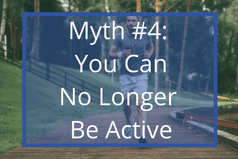 This is especially important if you experience confusion, severe headache, difficulty walking even a short distance, and have a hard time catching your breath. An exacerbation can cause further damage to the lungs, so it is important to prevent flare-ups and to know the symptoms so that you can seek help. 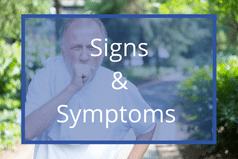 For a complete list of COPD symptoms and signs of a COPD exacerbation, review our article about COPD Signs and Symptoms. While there is a small segment of COPD patients who are born with a predisposition for this disease, it is largely a preventable condition. Quit smoking. Cigarette smoke is the number-one cause of COPD. If you smoke, remember that doing so increases your chances of developing the disease, further worsens the disease once you are diagnosed, and affects those around you as well. As mentioned, cigarette smoke is the leading cause of COPD, but that doesn’t apply only to those who smoke. Frequently inhaling secondhand smoke will also dramatically increase one’s chances of developing COPD. Though smoking is the leading cause of the disease, it isn’t the only one. Dust, smoke, airborne chemicals and pollution can also be very harmful to the respiratory system and could lead to COPD. Be aware of these threats both at home and in the workplace and mitigate exposure accordingly. Visiting the doctor frequently to monitor your condition and treatment. Getting enough sleep every night. Getting vaccinated to prevent illnesses such as the flu and pneumonia. Addressing your emotional health can be effective in managing COPD. Sometimes people start or increase their smoking to cope with emotional stress. Addressing the source of stress and eliminating or managing it can be an important step in controlling smoking habits that further worsen your COPD. It’s also important to reduce stress and anxiety in order to help regulate breathing. Those with COPD can become short of breath very easily, which can be quite frightening and may cause a panic attack that further worsens symptoms. In tandem with regular exercise, a reduction of stress and anxiety can help to mitigate symptoms. 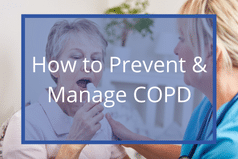 From bronchodilators to corticosteroids and oxygen, there are a number of treatments that a doctor may prescribe to help manage COPD. 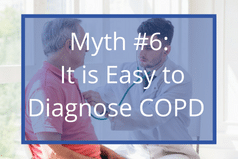 Being as there is no one-size-fits-all treatment for COPD, it’s important to see your doctor regularly to ensure you receive the proper prescription for your needs. 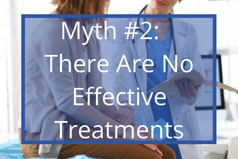 It’s also notably important that if prescribed a medication, it is taken exactly as instructed for maximum effectiveness. Breathing exercises can help to strengthen your breathing muscles when you have COPD. This can help you to get more oxygen into your lungs, making you feel more comfortable. Some exercises can also help clear the lungs of mucous, which helps to reduce the effort needed to breathe. They can also help to release trapped air in the lungs. Review and discuss the exercises below with your doctor. This exercise will help to prevent air from getting trapped in your lungs, and may also help to relieve stress and anxiety. First, breathe into your nose for a count of two or three. Then purse your lips like you are going to whistle, and breathe out through your lips for about twice as long as you inhaled. Try not to force the air out. Repeat until comfortable, increasing the inhale and exhale counts over time. Focusing on performing abdominal breathing correctly should soothe you and make it easier to bring your breathing under control. While sitting or lying down, start by placing one hand on your abdomen, and the other on your chest. Slowly breathe in, focusing on expanding your belly and trying to keep your chest still. Breathe in for a count of three, then breathe out slowly through pursed lips for a count of six. You can press lightly on your stomach to help release air from your lungs. This exercise should help you to clear your lungs of mucus. First, inhale through your mouth as you would in abdominal breathing, taking a slightly deeper breath than normal. Put your hand on your stomach, and activate your stomach muscles. With your mouth open, blow the air out in three even breaths while making the sound “ha, ha, ha”. To perform a controlled cough, sit with your feet on the floor. Lean slightly forward with your arms folded across your stomach. Breathe in through your nose, and as you exhale, lean forward a little more and press your arms against your abdomen. Produce 2 – 3 short, sharp coughs with your mouth partially open. Breathe in slowly through your nose again, and take a rest. Repeat as necessary. 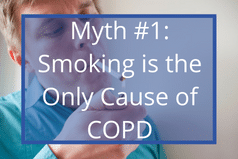 Although smoking is the single most common cause of COPD, other potential risk factors include exposure to second hand smoke, certain chemicals, dust, fumes, and outdoor pollution. Certain genetic predispositions may also contribute toward the development of COPD. Those with an AAT (alpha-1-antitrypsin) deficiency are more prone to emphysema, especially when combined with smoking. While COPD is a progressive disease and there is no cure, there are lifestyle changes and treatments that can alleviate symptoms and improve quality of life. Quitting smoking, if applicable, is a top priority in managing the disease and its symptoms. While it is more common for middle-aged and elderly people to be diagnosed with COPD, younger smokers in their thirties or forties can be screened for signs of COPD before they start to exhibit symptoms. With lifestyle changes and treatment, people with COPD can continue to lead a quality life. While difficult, the most important thing you can do if you have COPD is to quit smoking. Your doctor can direct you to a pulmonary rehabilitation program that will provide nutritional advice, information on breathing and other exercises and overall education on your condition. Once a person is diagnosed with COPD, the damage is done and the lungs will not repair themselves – even if you quite smoking. 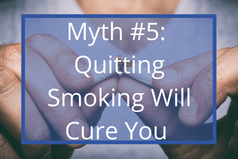 However, quitting smoking prevents further lung damage that would accelerate progression of the disease and its symptoms. COPD is an under-diagnosed condition in Canadian adults. Many people who have the illness don’t even know what COPD is. Early recognition of symptoms is important for initiating treatment, relieving symptoms and slowing the progression of the disease.